This is the most labour-intensive recipe posted here so far, but it is a delicious one. It is a Middle Eastern dish heavily adapted from Jerusalem: A Cookbook . It is actually the cover recipe of the book, to give you a sense of what I mean by ‘heavily adapted.’ The original recipe calls for using yields from three other recipes to make it, harissa and preserved lemon peel, and Zhoug. I use none of these here, but I bring in ingredients from all into the dish. There are quite a few exotic spices in this recipe, the most exotic of which is sumac. Sumac is a slightly tart spice that can be used as a salt replacement. It is a beautiful purple color and the reason the lamb in the picture looks the way it does. You may have seen it in salt shakers at Middle Eastern restaurants. If your grocery store doesn’t carry it, check Middle Eastern or Mediterranean shops or look for it online. The recipe calls for ground seeds so if you have a mortar and pestle, it’s time to break it out! If you can’t be bothered, use already ground spices. We used our brand new mortar and pestle but we only had caraway and cumin seeds on hand and we used already ground coriander. Directions on how to prepare your own ground spices are below in the Tips section. We serve it with two slices of toast and a salad with carrots, beets, avocado, pomegranate seeds (when they’re in season), and a simple dressing. Heat the olive oil in a large, heavy-bottomed frying pan on medium-high heat (I used a 12″-inch stainless steel pan). 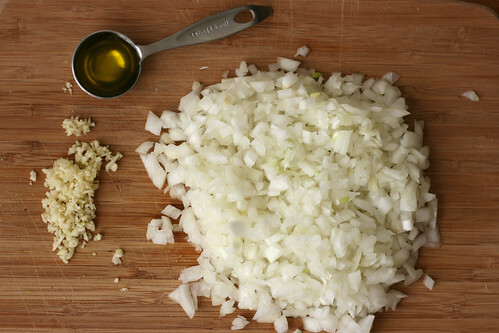 Once hot, add the onion and garlic and sauté until the onion softens and becomes translucent, about 6 minutes. Raise heat to high and add the lamb, breaking it up into smaller pieces with a wooden spoon. 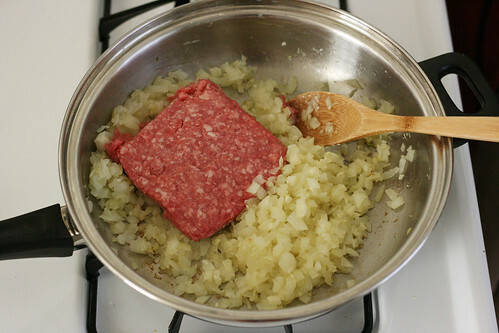 Cook until it is well browned, about 5 to 6 minutes. Season with sumac, cumin, and ground pepper and cook for another minute. 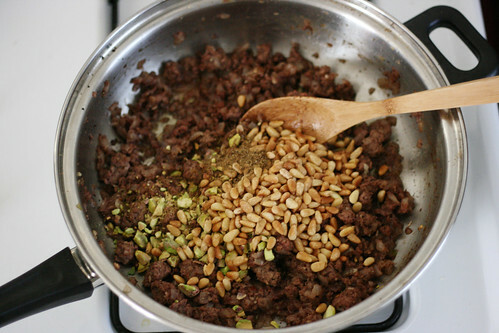 Turn off the heat and stir in most or all of the pine nuts and pistachios — we reserved some to use as a garnish. Also stir in at this point the ground spices (coriander, caraway, cumin), red pepper flakes, and freshly squeezed lemon juice. Set aside while you prepare the salad. Combine all of the salad ingredients. 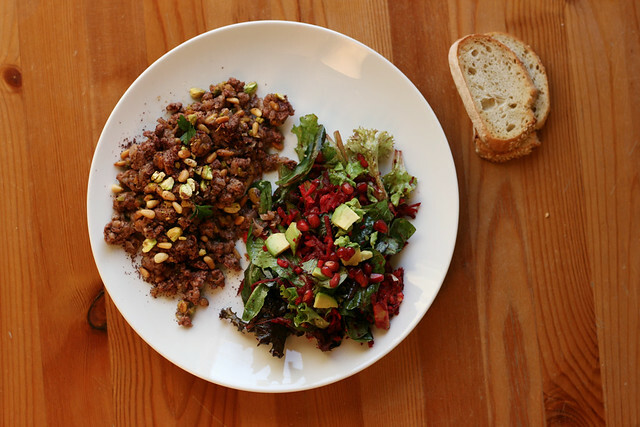 If you wish, before combining, set aside some of the avocado and pomegranate to use as a salad garnish. Return the lamb dish to the stove and add in the chicken stock. Bring to a boil, then simmer until the stock evaporates, about 5 minutes total. 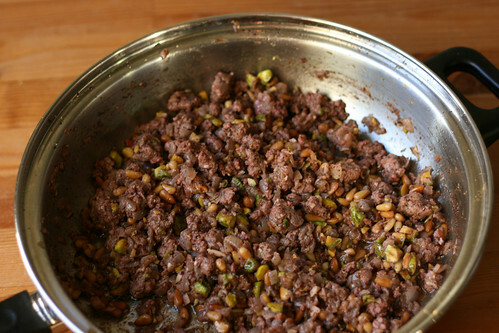 Plate the lamb dish and season with any leftover nuts, parsley or cilantro, and sumac. Serve at once. We served it with two slices of bread on the side. To toast your own nuts, first preheat the oven to 350°F. Spread the nuts out onto a rimmed cookie sheet. Toast pine nuts until they are slightly browned, about 5 minutes. 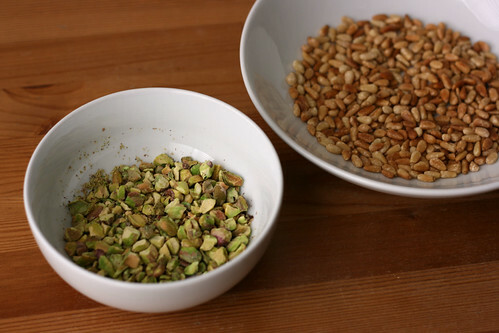 Toast shelled pistachios until they are fragrant, about 6 minutes. Transfer the nuts to a cool surface right away to prevent them from overcooking in the warm sheet. 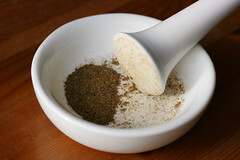 If you want to grind the spices using a mortar and pestle, start out by heating a small, dry frying pan over low heat. 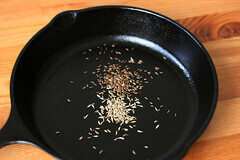 Add the coriander, caraway, and cumin seeds and, stirring occasionally, lightly toast until fragrant, about 2 minutes. 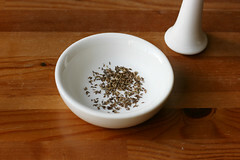 Transfer the toasted seeds to a mortar and grind to a powder using a pestle. 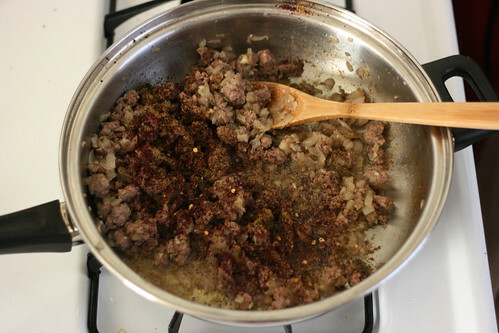 I’ve replaced the harissa with the freshly ground spices (coriander, caraway, and cumin) and crushed red pepper flakes. The original recipe calls for 2 teaspoons harissa paste. I’ve replaced the preserved lemon peel with the freshly squeezed lemon juice. The original recipe calls for 1 tablespoon of finely chopped preserved lemon peel. The recipe suggests using either 1/4 cup fresh cilantro leaves or 1 tablespoon Zhoug. I used a couple of fresh flat-leaf parsley leaves per dish instead. I feel misled. I thought Tiglath-Pileser III was still alive. Also, compliments followed by blatant lies are no compliments at all.